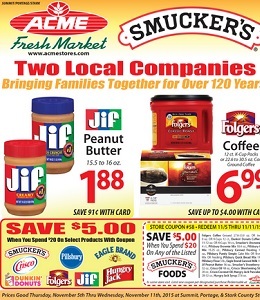 Current best Acme savings valid November 5 – 11, 2015: $1.88 Jif Peanut Butter; $6.99 Folgers Coffee; $6.48 Luvs Jumbo Diapers; $.99 Acme Fresh Market Fresh Baked! Pumpkin Muffins; 2/$5 Dole 100% Juice; 2/$4 Juicy Juice Fun Size; 2/$4 Welch’s Refreshingly Simple Juice; 4/$5 Acme Fresh Market Bread; 2/$5 Food Club Cereal or Oatmeal; B1G2 Free Progresso Soup; 3/$5 Food Club Pickles or Olives; $2.99 Hershey’s Baking Cocoa; $1.49 Food Club Cinnamon; $1.88 Libby’s 100% Pure Pumpkin; $13.99 Boss Claw Crab Meat; $14.99 Tide Pods Laundry Detergent; $2.79 Al’s Gourmet Shrimp Sauce; $3.99 Organic Valley Milk; 4/$10 Food Club Cheese; $4.99 lb Acme Fresh Market Ham; 3/$10 Pierre’s Premium Ice Cream; $1.88 Food Club Garlic Bread; 5/$5 Pure Protein Bars; $.98 Handi-Foil Eco-Foil Turkey Roaster; $3.99 lb Gerber’s Amish Farm Boneless/Skinless Chicken Breasts; 2/$6 Eckrich Smoked Sausage or Kielbasa; 20/$9 Friskies Cat Food; $8.99 Purina Dog Food; $1.79 lb Green Peppers or Green Beans; 5/$10 Celery Stalks; $10.99 Sea Best Sea Scallops; 2/$5 Nabisco Premium Saltine Crackers; 5/$10 Keebler & Kellogg’s Snacks; and more. Find all deals and offers from every category, in the latest Acme Weekly Ad for your local store.